There’s a reason every UFC, Muay Thai, Boxing or other sport-fight is stopped immediately upon a knock-out shot… Because once you’re knocked out, you’re as good as dead. If, by some unfortunate circumstance, you end up in a fight, there’s a real danger of getting knocked out… And once you’re knocked out, you have literally no defense – you’re 100% at the mercy of your attacker(s). For this reason, it’s extremely important that you understand the physiology of what gets you knocked out, and learn techniques to defend yourself against a knockout punch at all costs. First I’m going to explain the physiology of your brain and skull, what happens in a “knock-out shot”… This is the “why” of why you get knocked out. What actually causes the knock-out (and in severe cases, paralysis or death) is a not a direct impact “whack to the head”. What does it is a sudden rotation of the skull. Got it? Your brain is an upside-down-strawberry-Jello-bowl. Check. Imagine you’ve got that bowl of jello in your hands. DON’T EAT IT. (It’s your brain). Now as fast as you can, rotate that bowl of jello a quarter turn… What does the jello do (besides be delicious)? Like your brain, jello is soft, flexible and mostly liquid… So when you suddenly spin the bowl, the jello takes a moment to catch up… it sits still as the bowl spins, then its few attachment points are yanked and pull it to try to make it catch up to the bowl. Now when you do this with jello, no big deal. You may spill some on your lap, but you’re used to that. But if we remember that the Jello is your BRAIN, we start to see the problem. Remember those few attachment nerves and arteries I mentioned? Well, as your skull rotates, all the attachments to the brain from the skull get seriously stretched and even torn while the brain stays still for that split-second… Furthermore, if the sudden rotation is fast enough, the brain ‘smacks’ into the walls of the cranium, essentially bashing your brain against your own skull. If the acceleration is sudden enough, and the damage is severe enough, your brain shuts down to “reboot”. (If it’s REALLY bad, like in a car accident, there is no ‘reboot’… It’s more of a “game over”). Despite your surprisingly delicate physiology, there are tricks to avoid getting knocked out… You see, it’s very hard to knock you out if you are prepared for the punch. Your neck muscles are quite strong, and can prevent this kind of head rotation in many cases… That is IF you see the punch coming. The ability of these muscles to resist rotation is greatly affected by the angle at which you hold your chin… If you go into any boxing gym worth it’s weight in dirty sweat socks, you are likely to hear someone shouting “chin DOWN!” at sparring boxers. That’s because those trapezius muscles have a lot more leverage to hold your head in place when your chin is down… when your chin is up, not only is it a much more viable target, but you’ve got almost no power to resist the rotation of your head caused by impact. But a strong neck and proper head/chin position is only part of the battle… Because that doesn’t help you AT ALL if you don’t see the punch coming. It’s the punch you don’t see that knocks you out. So the next step is to increase the chance that you WILL see the punch coming. Again, keeping your chin down helps in this regard. 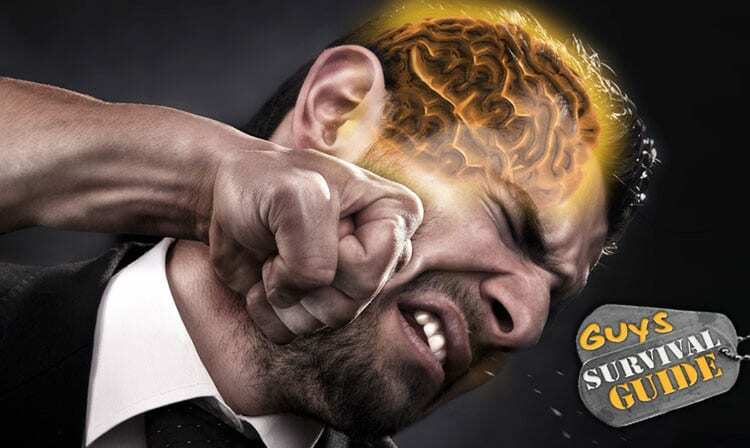 The uppercut and hook are the punches that tend to knock people out, as they both strike your chin, pivoting your head at the furthest point from the Atlas (the pivot point of the skull and the kneck). The most deadly combination is being hit by an unseen uppercut, which whips your chin up, and then being hit by an unseen hook to your now very exposed chin, which whips your head around and finishes the job. Keeping your chin down does two things: first, it makes this a harder target to strike, as there’s less ‘under-chin-area’ exposed to hit. Second, it increases your peripheral vision, making it easier to see all around you, and thus to see punches coming. If you don’t believe me, check it out. Stand with your head perfectly level and look straight ahead… Now have a friend stand a few feet to your side and have them walk backwards until you can’t see them any more out of your peripheral vision… Now, while still looking forward, lower your chin and your gaze, and you’ll see them again… have them move back further and further until you can’t see them. You’ll see that you have MUCH wider peripheral vision when your chin is down. This is also important when fighting multiple opponents, as it gives you a better sense of anyone coming up behind you. The first is a strong neck. Your trapezius muscles do the stabilizing of your head and neck, and developing strong traps will help you have what is called a ‘strong chin’ in boxing (meaning you’re hard to knock out… as opposed to a ‘glass chin’ which means you are knocked unconscious combing your hair). These tricks can go a long way to helping you avoid ever getting knocked out… Which ultimately could save your life. What’s surprising to me is how few people REALLY know how to do just that. I’ve seen people with years of martial arts experience who couldn’t punch their way out of a paper bag… So, do YOU know how to throw a punch correctly? Find out in my next article: How To Punch Part 1 & How to Punch Part 2. Great article man, learned allot. Article is awesome helped out a lot. I’m looking into boxing and mma but where I live there is no trainers or gyms for that here in Williston North Dakota. I’m probably going to read as many of your articles as I can. If there’s any way could you possibly give me a few tips on what I should start out with research wise? The Tao of Jeet Kune Do by Bruce Lee is a fantastic foundation for MMA. He was the “grandfather” of mixed martial arts, and there is a ton of valuable information in that book! A blow to the side of the head that causes a fracture can rupture the middle meningeal artery. This can lead to a epidural hematoma, which if left untreated often leads to death. Patients often report feeling fine right after the accident, but lose consciousness some time later and can eventually die without surgical intervention. Patients that lose consciousness immediately after the accident are at a greater risk for death compared to those who have moments of lucidity after the accident, and surgery should be prompt in order to save the patient. Symptoms can included fixed and dilated pupil on the side of the injury, and the eye will often be positioned down and outward on the the eye on the same side o the injury. This injury is the most common brain injuries seen in sports and car accidents. Thanks for adding the detailed explanation. What you’ve described results in the “magic hour” where the victim has about an hour to get the mounting pressure in their skull/brain relieved before it kills them. As a kickboxer the best way for me is to keep him away with your front kick. (Your choice) choose a comfertable side stance that suits you and thrust your enemy away with either front kick or side kick. If your more of a boxer, learn to bob-and-weave. Boxers best defense stratergy, move and never stand still. ok… I admit it. You’re good.